Sein sicherer Pinselstrich und die wilden, dynamischen Bewegungen seiner Motive sind auf den ersten Eindruck abstrakt und trotzdem lebendig. 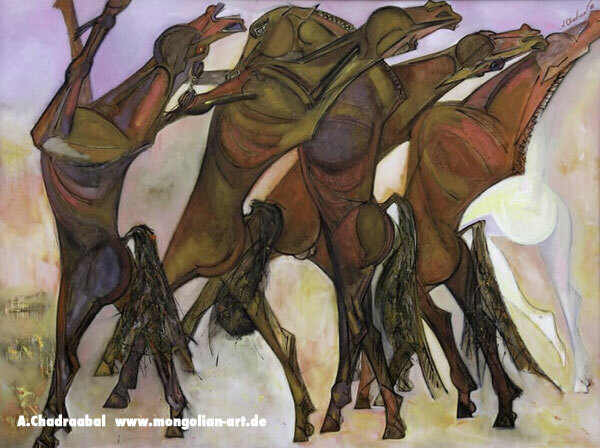 Aus den Darstellungen sprechen sogar starke sexuelle Potenz und emotionaler wilder Mut der gemalten Tiere. 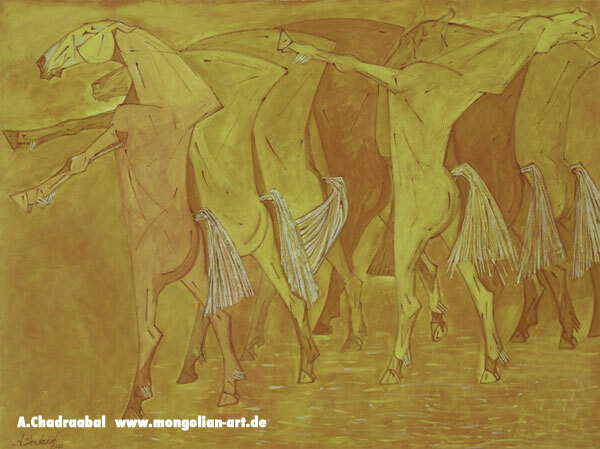 Die gut entwickelte Muskulatur seiner Pferde erzeugt ausdruckskräftige Charaktere und aktionsgeladene Spannung. 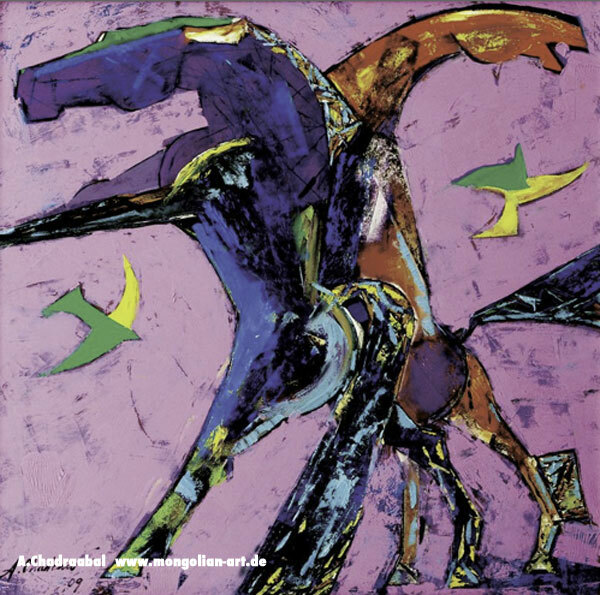 Die Pferde symbolisieren ein gesundes, vitales Leben voller Kraft und Mut. Die Umsetzung von harten, kräftig platzierten Tierfiguren wird mit einer klaren und sauberen Farbgebung kombiniert. Es ist kein Wunder, dass ausgerechnet ein Mongole ein so starkes Empfinden für Pferde hat, weil sich ein Mongole ein Leben ohne Pferde überhaupt nicht vorstellen kann. 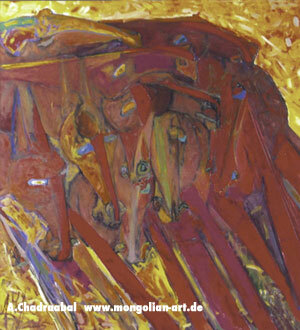 Ein Besuch auf seine Webseite www.chadraart.mn lohnt sich! Chadraabal wurde 1979 in Zuun mod sum, Töv aimag der Mongolei geboren. Sein Vater Adyabazar ist ein bekannter Künstler in der Mongolei. 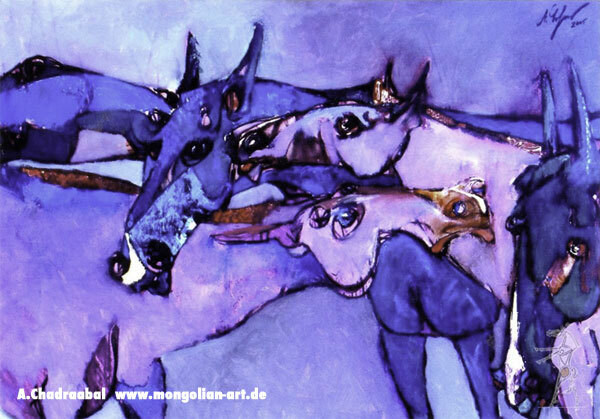 1997-2001 Studium an der Fakultät für Bildende Künste der Staatlichen Pädagogischen Universität der Mongolei in Ulaanbaatar. 2003 Master für Bildende Künste in Ulaanbaatar. 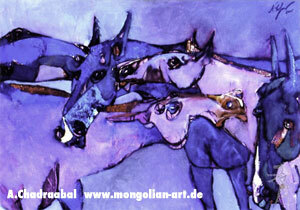 2001-2007 Dozent an der Fine Art Department der MSUE. 2003 Mitglied der Union der mongolischen Künstler (UMA). 2004 Leiter und Mitglied - Der Verband der jüngste Künstler in der Mongolei. 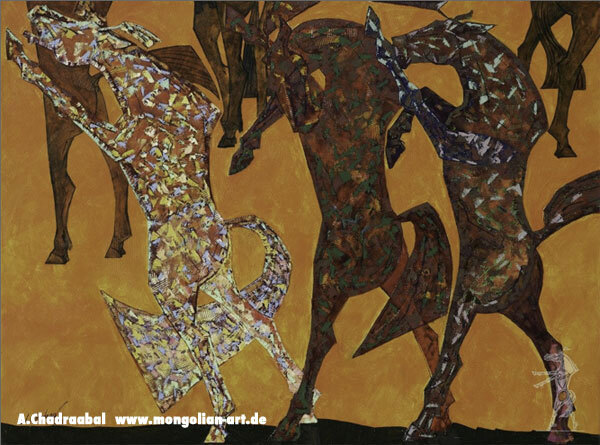 2008 Maler der UNITEL Corporation. 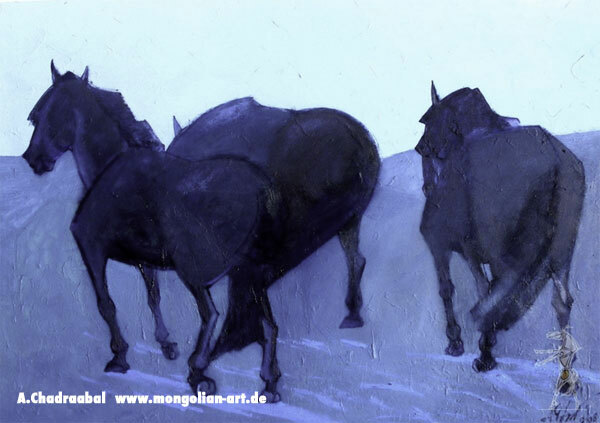 Seit 2009 Vorsitzender - Der Verband der jüngste Künstler in der Mongolei. 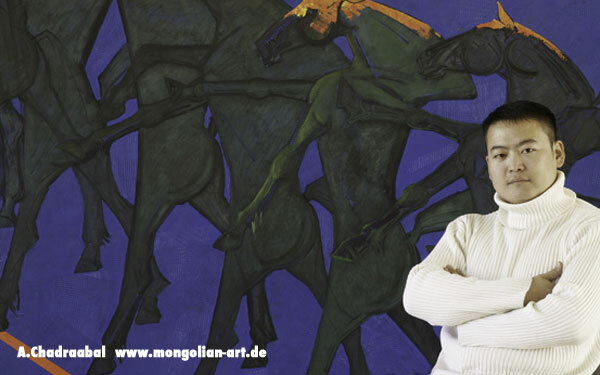 Seit 2009 Direktor der mongolischen nationalen Galerie für moderne Künste. 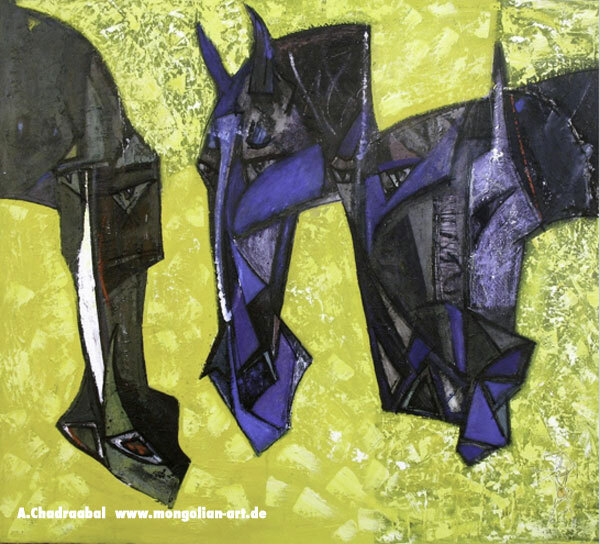 2004 "Blau Regen" Ausstellung. Mongolische Kunst Museum, in Ulaanbaatar. 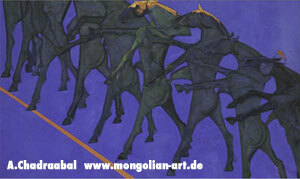 2005 "Talyn Mongol" Ausstellung in Paris, Frankreich. 2006 "Turleg Uulsaar" Ausstellung in "Xanadu Kunst" Galerie, Ulaanbaatar. 2008 "Road of the Sun" Ausstellung in Seoul, Korea. 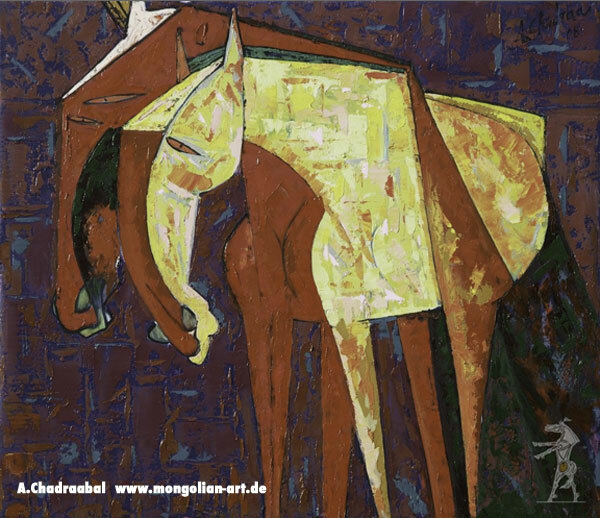 2009 "Pferde-Komposition" Ausstellung in der Botschaft der Bundesrepublik Deutschland, Ulaanbaatar. 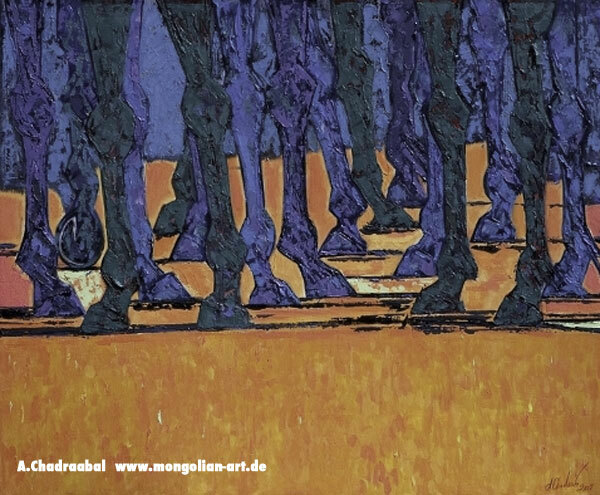 2002 "Frühling", "Herbst" Ausstellung. Union of Mongolian Artists Art (UMA) Galerie in Ulaanbaatar. - "EXPO -2002" Ausstellung in Yan-Jing, China. 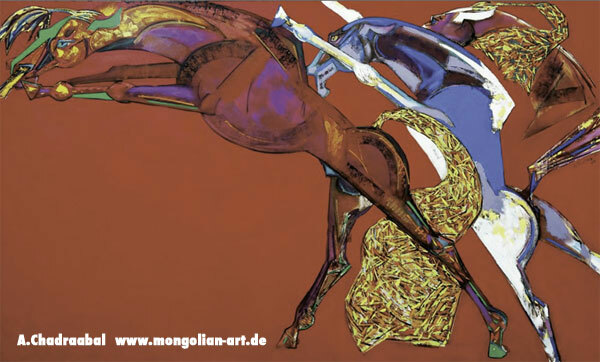 2003 "Die Farben" Ausstellung Botschaft der Republik Bulgarien, Ulaanbaatar. 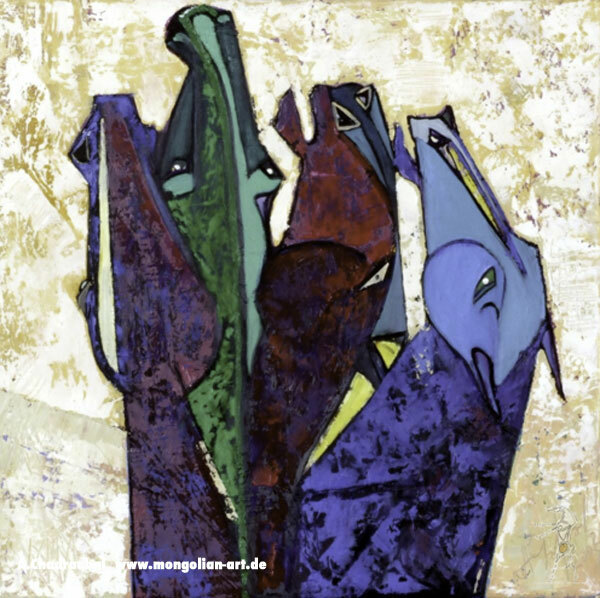 2004 Ausstellung in Bun Bunnik, Niederlande. 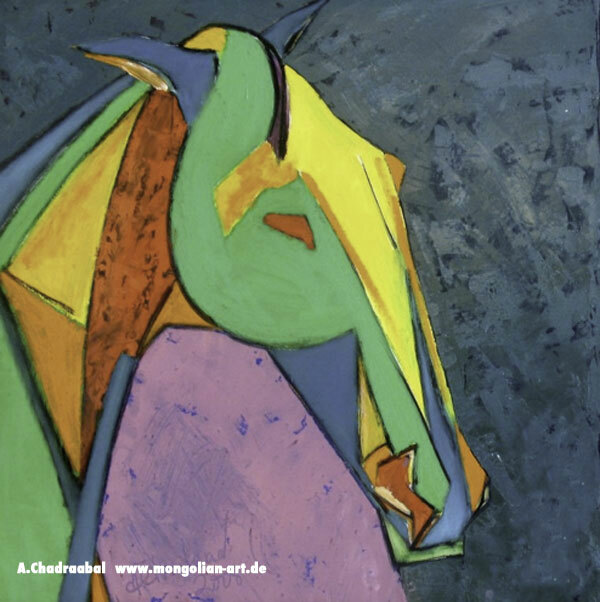 - "Beste Kunstwerke"- Ausstellung. 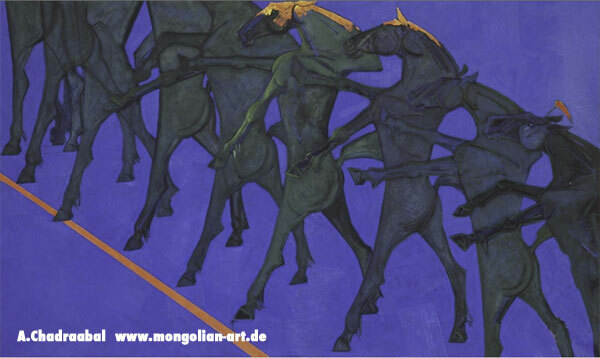 Union of Mongolian Artists Art Galerie, Ulaanbaatar. 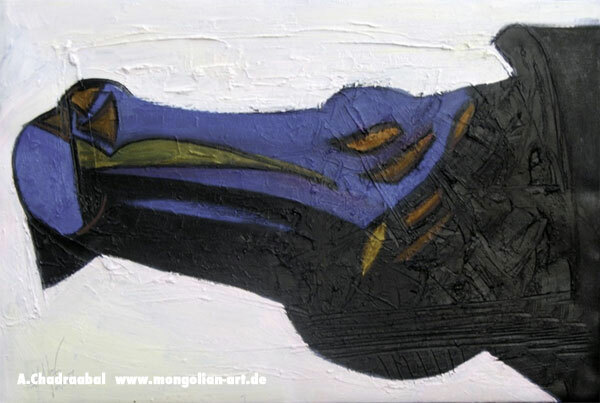 - "Mongolian Farbe" Ausstellung in Sofia, Bulgaria und in Budapest, Ungarn sowie in Warshaw, Poland. 2005 "Asia Center" festiva in Unesco, Paris, Frankreich. 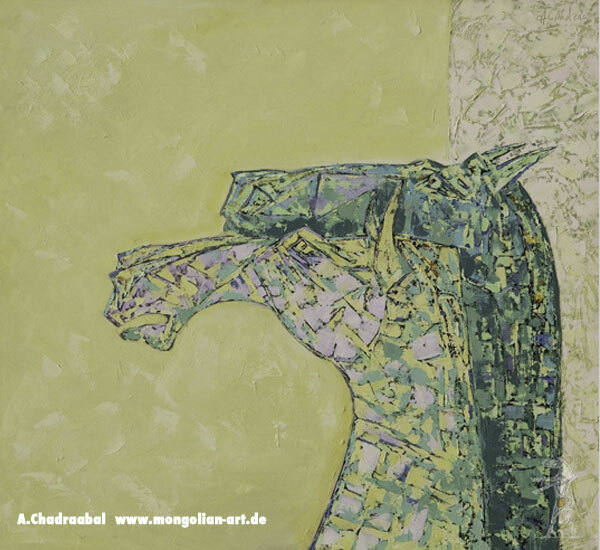 - Ausstellungn in Berlin, Deutschland. 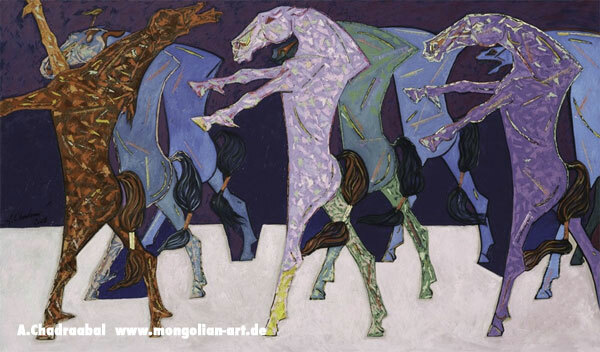 2006 "Mongolian cultury" Ausstellung in Wien, Österreich. 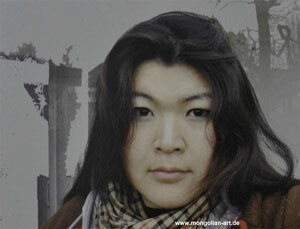 - "EXPO-2006"-Ausstellung in Yan-Jing, China. - Ausstellung in San-Francisco, USA. 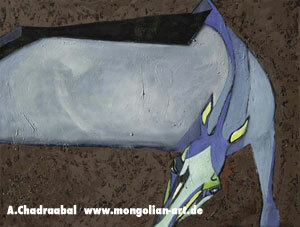 - "Triangle" Ausstellungin Union of Mongolian Artists Art Gallery, Ulaanbaatar. 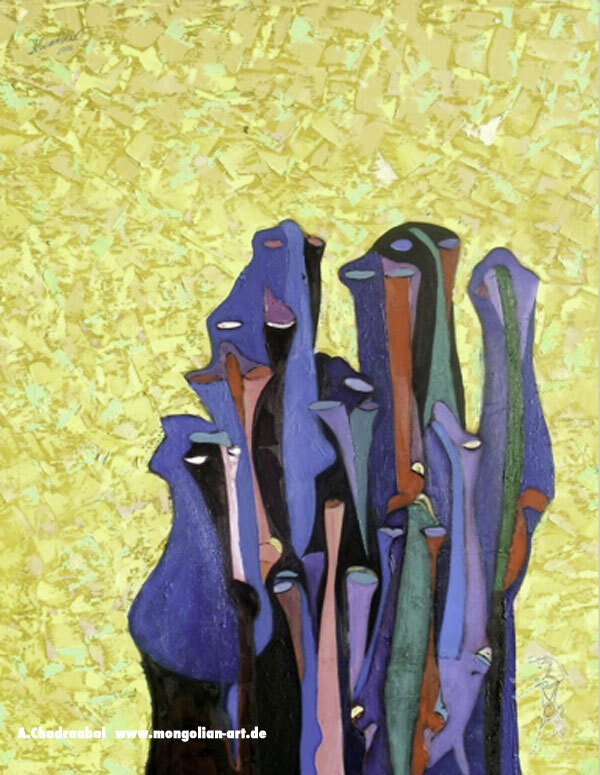 2007 "Asiatische Kunst" Ausstellung in Seoul, Korea. - "EXPO -2002" Ausstellung in Tottory, Osaka, Japan. 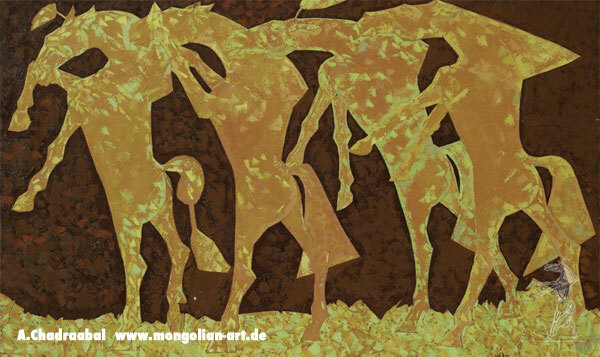 2008 "Beijing bennal-2008" Ausstellung in Beking, China. Good Day To You! I am very happy that you are visiting my earth of art with me. 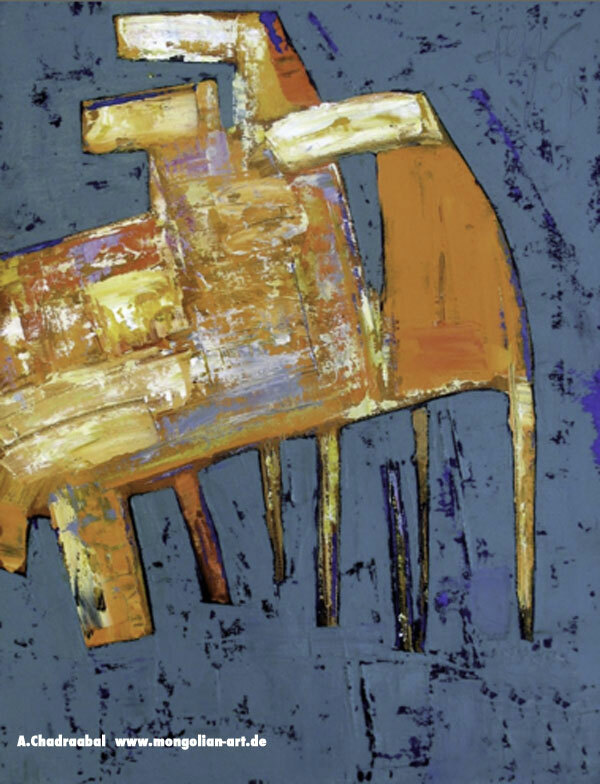 The paintings you are looking at are my job in the last three years. I will be continuing on my creation not losing any time. A painter is one of the people who create for you, deliver to you, make you believe and surprise you one`s own inner secret and ability created by art, development of mentality and potential capacity, and the cognition of reality after people come to the world. Yes. 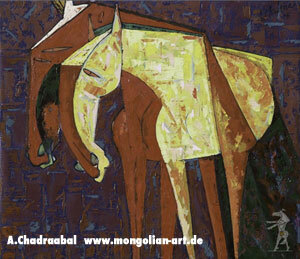 I am proud of being a Mongolian painter. This is the biggest gift given from the God. 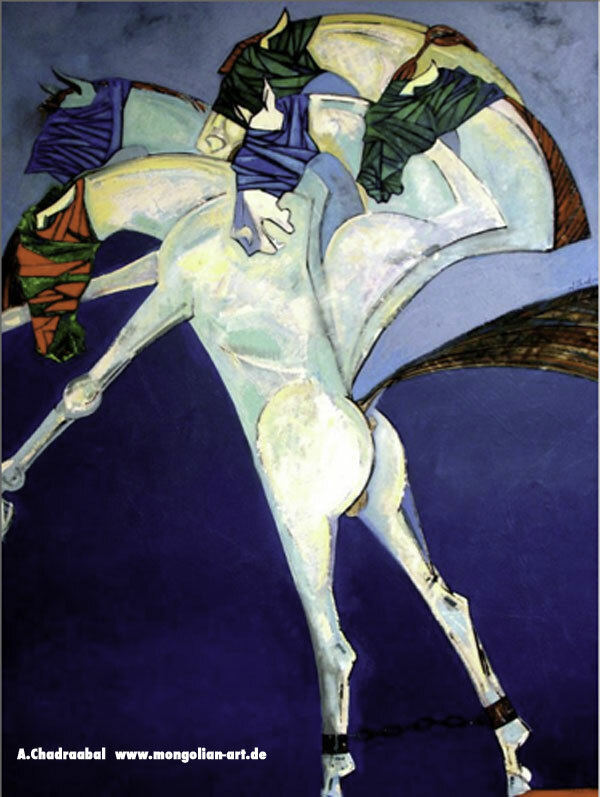 A painter lives in the world of realism and idealism. 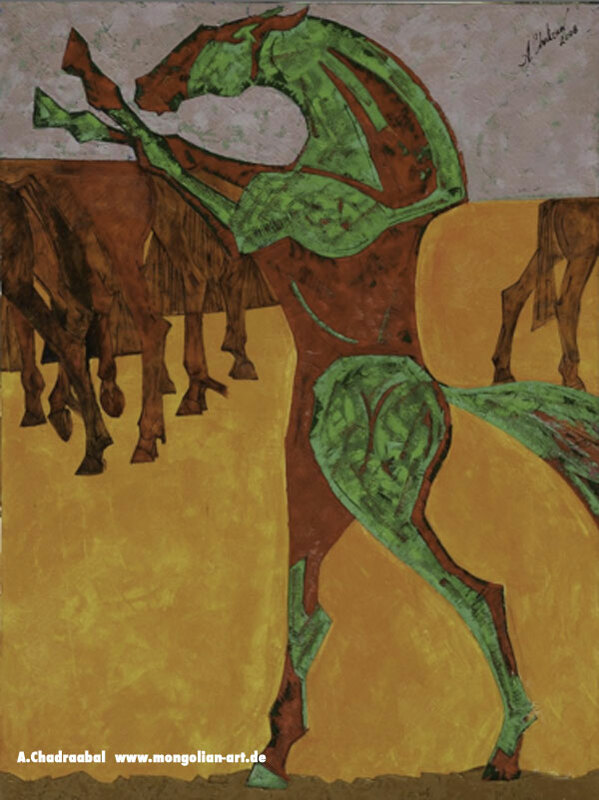 That is why the painter tries to show “to be or not to be” cases by using his different colors and paintbrush. I wanted to demonstrate you, if not all, some of this real and not real mixed role to you. 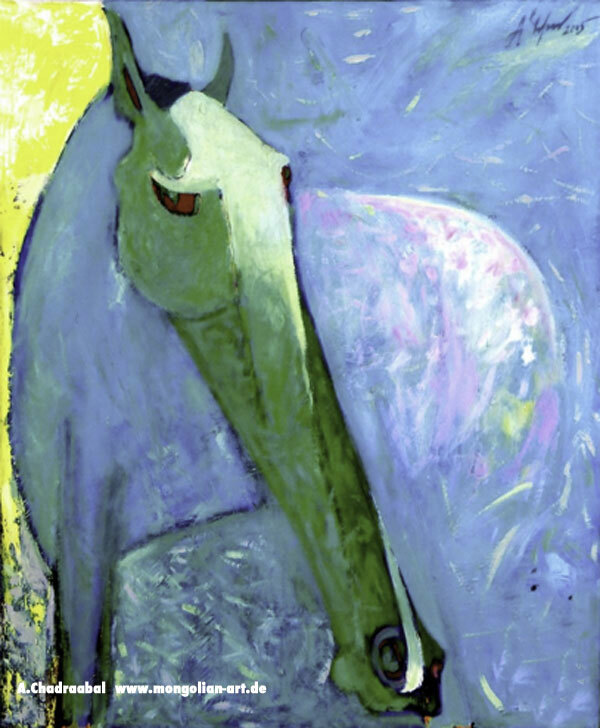 My main concern is horses. 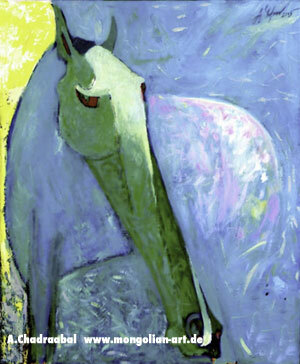 My horses try to reflect the past, present and future of human life. It might be incomplete. It is open to your consideration. 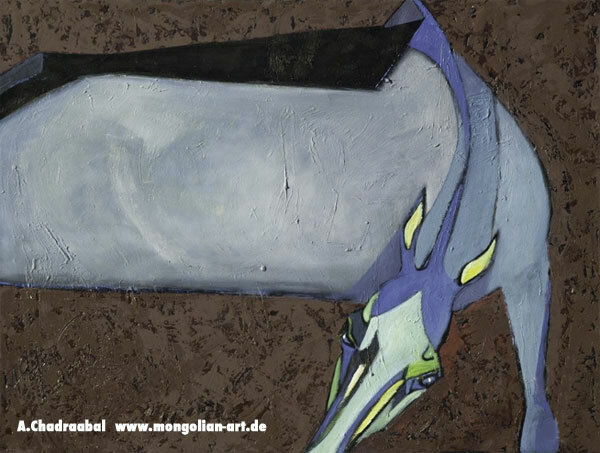 I do not know which of your senses such as sadness, happiness etc may arise from my paintings. 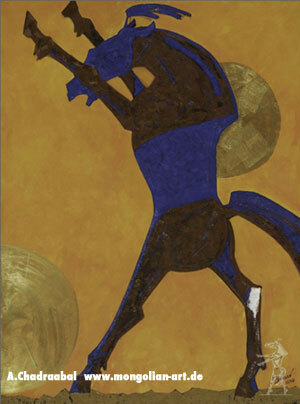 However, many thanks for your arrival to come to my paintings. I am motivated with your attendance to pay your attention and to understand my inner world. Thanks for my art friends on their trust and maintenance. 2001-2007 a lecturer at Fine Art Department of the MSUE. 2003 Became a member of the Union of Mongolian Artists. 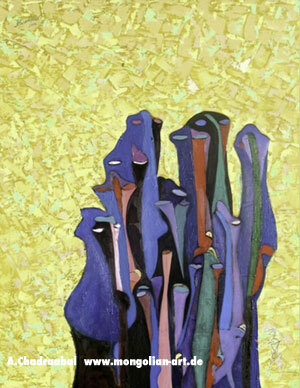 2004 Head a member of Association of Youngest Artists. 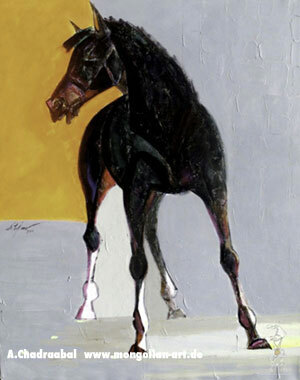 2008 Painter of UNITEL corporation. since 2009 Chairman of Association of Youngest Artist. 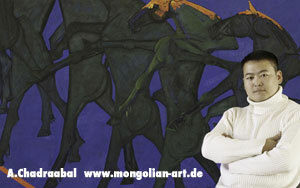 since 2009 Director of Mongolian national modern art gallery. 2004 “Blue rain” exhibition. 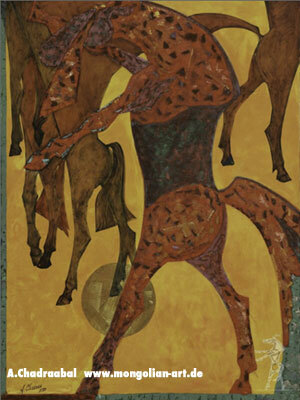 Mongolian Fine Art Museum, Ulaanbaatar. 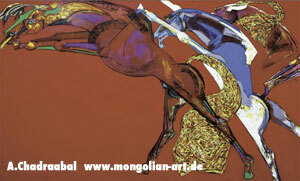 2005 “Talyn Mongolia” exhibition in Paris, France. 2006 “Turleg Uulsaar” exhibition in "Xanadu Art" gallery, Ulaanbaatar. 2008 “Road of the Sun” exhibition in Seoul, Korea. 2009 "Horses composition" exhibition in Embassy of the Federal Republic of Germany, Ulaanbaatar. 2002 “Spring”, “Autumn” exhibition. Union of Mongolian Artists Art Gallery, Ulaanbaatar. - “EXPO -2002” exhibition in Yan-Jing, China. 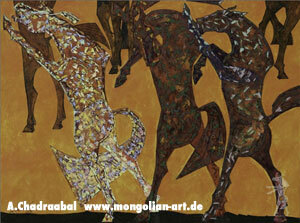 2003 “The colors” exhibition, Embassy of the Republic of Bulgaria, Ulaanbaatar. 2004 Group exhibition in Bun Bunnik, Netherlands. 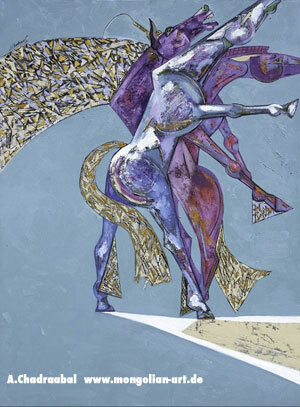 - “Best of art works” exhibition. 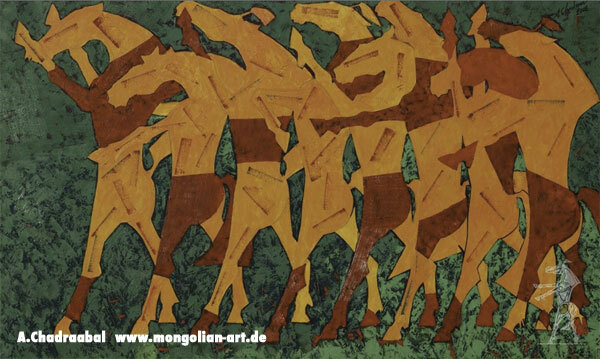 Union of Mongolian Artists Art Gallery, Ulaanbaatar. 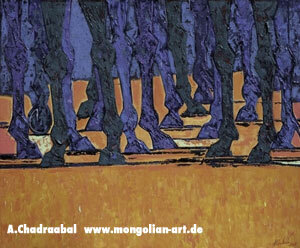 - “Blue Mongolia “.exhibition in Beijing, China. 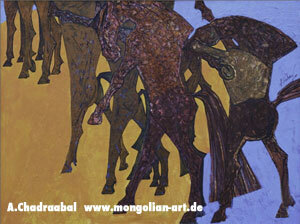 - “Mongolian color “exhibition in Sofia, Bulgaria, in Budapest, Hungary, in Warshaw, Poland. 2005 “Asia center” festival, Unesco, Paris, France. 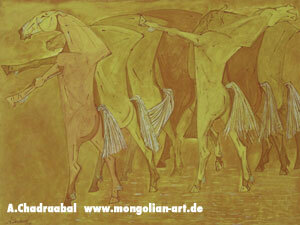 - Group exhibition in Berlin, Germany. 2006 “Mongolian Cultury” Group exhibition in Vena, Austry. - “EXPO-2006” exhibition in Yan-Jing, China. - Group exhibition in San -Francisco, USA. - “Triangle” exhibition, Union of Mongolian Artists Art Gallery, Ulaanbaatar. 2007 “Asian art” exhibition in Seoul, Korea. - “EXPO -2002” exhibition in Tottory, Osaka, Japan. 2008 “Beijing bennal-2008” exhibition in Beijing, China. 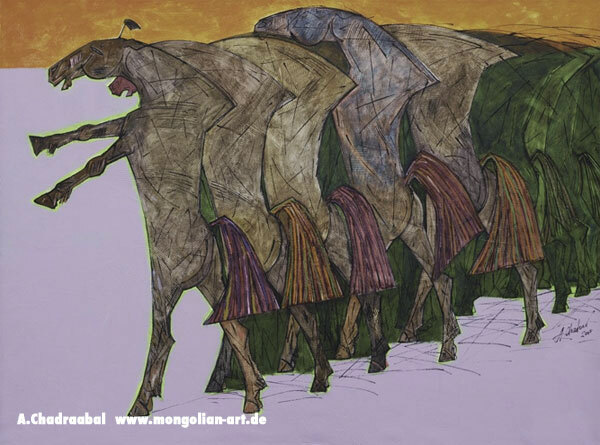 - Group exhibition in San -Francisco, America.